So what exactly IS the deal with Albert Haynesworth? The Patriots make the trade for him, he shows up, passes his physical and his conditioning test, practices twice, and we’ve not seen him again. Speculation from the usual suspects is predictable – he’s dogging it, he’s a bad dude, he’s just lazy, turn your radio onto either sports radio station in town, and you’ll likely hear some variant of that. 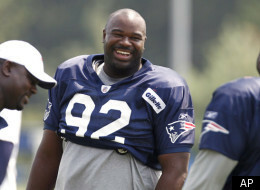 Chad Ochocinco and Albert Haynesworth might not be long for New England. One day before this story came out by my guy Mike Reiss, one NFL executive familiar with the Patriots ways told me he believes one or both of the big name acquisitions will be cut before the season starts. The front office man thinks coach Bill Belichick will use the controversial players to help control and send a message to his locker room. Say what? Since when exactly has Bill Belichick done anything like this? “Controversial” players brought in by Belichick have a pretty decent track record. Belichick cuts players because they can’t help his football team, not to send any sort of message to the locker room. Mike Reiss feels that Belichick answered that statement with what he said during his Patriots Monday appearance on WEEI this week. A lot of discussion about Albert Haynesworth and his lack of practice time. Bill Belichick to sports radio WEEI on Monday: “I think Albert has been great since he’s been here. He’s worked hard. He’s done more than really what we’ve asked him to do. He’s put in a lot of extra time and a lot of extra effort to get back on the field, to study, to catch up on things from a playbook standpoint that’s he a little behind on.” Translation: Haynesworth is going to be a big part of what the Patriots do. Reiss, arguably the most plugged-in and perceptive reporter on the Patriots beat, reads into what the coach said, and draws a reasonable conclusion. But still….Haynesworth has only those two days of practice? What the heck is going on? This is where things get dangerous, as without information, people are left to speculate. Mostly, people tend to speculate to the negative, which leads to the “dogging it”, “bad dude” comments we’ve heard locally. Others, such a Tom E Curran and Karen Guregian recall that Haynesworth has needed “maintenance” sessions during previous training camps, including injections in his knees, and perhaps that is what is going on here. Could be. In looking at the situation, I can’t help but see how similar it is to Randy Moss’ first camp here in New England. You’ll recall. Moss gets traded to New England for a fourth round amid rumors and talk that he was dogging it in Oakland, a bad teammate, and a bad guy on and off the field. He comes to training camp, lights it up for a practice, then is out soon thereafter with what was reported to be a hamstring injury. He’s not seen again in the preseason. Speculation runs wild that Moss is in danger of making the club, that he will in fact be cut. What was happening those weeks where Moss was not at practice? He was getting ready for the season. Perhaps the Patriots saw all they needed to see in that initial practice – they could see he still had it, so there was no need to push him back onto the field. They wanted him ready for the season. As an added bonus, it gave opponents zero tape from which to prepare for the Patriots with Moss. It seemed to work out pretty well. Is it careless speculation to conclude that something similar is happening here with Haynesworth? Some reporters are tying to put a timetable on things – “If we don’t see him back in a week, I think he could be in danger of being cut.” I don’t see it like that at all. I wouldn’t be surprised if we didn’t see Haynesworth at all the rest of the preseason. Perhaps the Patriots saw all they needed to see in those two days of practice, during which Haynesworth reportedly was dominating the Patriots offensive linemen. Their focus now is making sure he is ready to start the season. From Belichick’s Haynesworth has been studying and catching up on the playbook, which sure seems like a positive. I’m not too concerned about it. If we get to the week of the season opener, and he’s still not at practice, then perhaps there’s something to be worried about, but let’s get there first. Thank you, thank you! I’ve been wondering since Haynesworth disappeared what was going on. I do listen to the local sports radio talk shows but have heard nary a word. I do hope it is all okay and Albert joins the Pats cuz if he’s on, he’ll be great. Especially standing besides Wilfork! They were waiting for his court case to be settled and not to overuse him before the season. Since the Pats are likely to be playing a 4-3 defense this year, a ton of reps for your veteran D-linemen isn’t really needed.